Similar to the GR8 Full Spectrum assessment, the GR8 Full Spectrum Plus is an all-encompassing tool for identifying the current abilities of a candidate, as well as their potential match for any given job position. The difference between the two instruments lies in the fact that, whereas Full Spectrum only includes the exercises found in the Cognitive assessment, Full Spectrum Plus utilises the ones associated with the Cognitive Plus instrument. 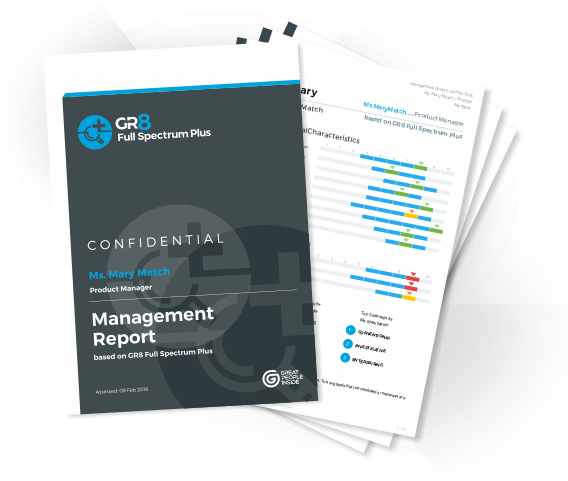 GR8 Full Spectrum Plus is intended for those who wish to assess managerial potential in terms of strategic analysis, complex thinking and innovation skills.